E Slater and H Cooper Feb 1901 A plan attached to the original lease shows the arrangement and nearby ownerships. Original pencil annotations are highlighted in red. Several large plots had been leased around the same time to James Walker, builder of many houses in Bingham, and show a strip of land annotated as ‘road reserved’, implying perhaps a plan to develop this whole area for housing. This strip is now Walkers Close, so the development happened eventually! 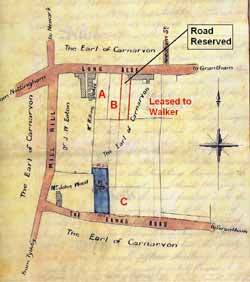 The two strips to the west are now Carnarvon House (marked A) and numbers 8 and 10 Long Acre (B). Plot C is now 7 and 9 The Banks, the villas built for Wesleyan ministers when they moved from the Chapel Lane premises when the school closed. The fact that plot C was leased to Walker rather suggests he built these too. It is assumed but cannot be demonstrated conclusively that 5 The Banks was built by Walker. It is of a very similar design to several other detached Villas from the period, one of which, Westholme, was definitely built by Walker. Others are Eastville, Northleigh, The Homestead and number 6 The Banks. A resident of Bingham whose father worked for Walker has independently identified several houses built by Walker. On 6th July1910 Mary Ann appointed her niece Lillie Tilt as executrix to her will. Lillie Tilt was married, according to the deeds papers, to a Nottingham tobacconist, Hugh Lambert Tilt, who was also a Sergeant Major in the Imperial Yeomanry South Notts Hussars. Directories of the time describe him as a drill instructor in Bingham. They had a daughter, Mary Ethel. Mary Ann Keiller left the property to Lillie’s children on attaining the age of 21. In the event there seems only to have been one. In 1901 (census) the Tilts and Mary Ann Keiller had lived in Church Street - possibly at number 17 if the sequences of the census returns reflect the order of houses in the street (not always the case). Tilt is described there as a Sergeant Major. 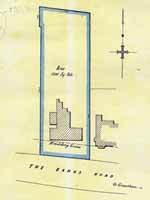 The electoral register for 1902 shows Tilt living in The Banks, so all of them must have moved into number 5 from the beginning. Directories list him as Squadron Sergeant Major Drill Instructor Imperial Yeomanry South Notts Hussars (1904) and of A Squad S Notts Yeomanry (1908). Four other officers and NCOs of the company were listed in the directory 1904 so the army clearly had a significant presence in Bingham at this time, although we do not know that these others lived in Bingham. On 15th April 1920 the Earl of Carnarvon sold the freehold of the property to Mary Ann Keiller. A plan was attached to the agreement. The Earl sold many freeholds in 1920, probably to raise funds for his excavations with Howard Carter of the tomb of Tutankhamun. Mary Ann died on 30 May 1920. The papers show that Tilt actually paid the money for the freehold. Mary Ethel Tilt later married Lewis Edward Cummings Walker. In 1947 Mary Ethel joined her mother as a trustee of her aunt’s estate. Hugh Tilt had held a lease on the property (from Miss Keiller) until his death on 23rd October 1942. In 1947 Lillie and Ethel sold the house for £2000 to George Henry Baxter, Gown Manufacturer’s cutter of Union Street, Bingham. In 1973 his widow, Violet Ferne Baxter sold the property to the present owners.